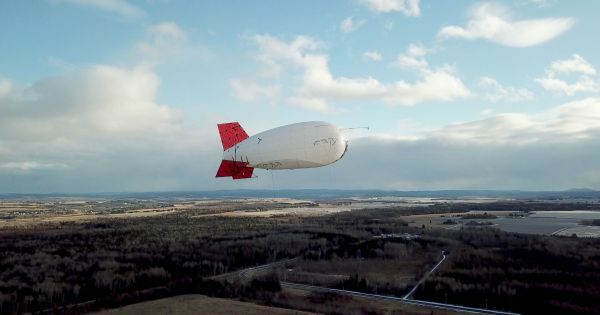 Instead of building cell towers or digging miles of fiber optic cables to bring internet access to far flung, rural ares, SoftBank-backed startup Altaeros plans to send a blimp up to the sky. Tethered to the ground and floating at around 244 to 259 meters (800 to 850 feet), these so-called SuperTower internet blimps seem like an innovative way to extend web access to those who previously had none. The idea might just float. Each SuperTower, according to Altaeros, can cover up to 10,000 sq.km. (3,861 sq.mi) of space, roughly equivalent to the same area 20 to 30 ground-based towers could. Unlike a regular cell site, however, a SuperTower can supposedly be installed faster and at a far lower cost. Each SuperTower is also fully autonomous, making it more reliable and cost-effective than other similar aerial, wireless internet technology. The SuperTowers work like a regular cell tower, but better. At higher altitudes, wireless signals — which work following line-of-site — can easily reach more people. Each of the internet blimps is equipped with multiple-in/multiple-out radio units, so users need not share just one signal. Internet providers can easily piggy-back into a SuperTower to boost their wireless LTE reach. Altaeros plans to have the service available this year. Altaeros isn’t the first to have thought about using balloons or blimps to extend internet services. Google parent-company Alphabet developed a similar idea called Project Loon, which was used in Puerto Rico as emergency internet cell sites after Hurricane Maria. Supposedly, Project Loon successfully brought internet access to more than 200,000 Puerto Ricans. Unlike Project Loon, however, Altaeros’ SuperTower is potentially more durable and reliable. It’s able to deliver internet speeds enough for video streaming, not just sending emails or text. The fact that these blimps will be tethered to the ground also makes them less likely to just go with the wind. A SuperTower can withstand winds at over 160 k/h (100 mph), supposedly. This doesn’t mean, however, that it’s not entirely prone to getting damaged. When it does, the fact that there’s only one SuperTower covering such a huge area could become a hassle when repairs or upgrades need to be done, as Motherboard notes. This is, perhaps, where other efforts to bring internet access to the masses can soar higher than Altaeros’ internet blimps. In the case of SpaceX’s plans, it’s quite literally higher. Elon Musk’s company plans to send satellites into space to build a global internet network. Two of these satellites were supposed to have been launched on the morning of February 22, but have been postponed to a later date. Aside from these, there are handful of other projects in the works to cut the internet divide. There’s Facebook’s open-source platform called OpenCellular, as well as their Aquila drone project. Meanwhile, an Alphabet subsidiary wants to use lasers to beam internet access to rural India. Private companies also aren’t the only ones who want to do something about it, with Canada and New York State each developing their own plans. With more than half of the world’s population still without internet access, these projects are all welcome. Internet providers are often reluctant to spend money on extending their fiber optic cables or building new cell towers only to get a handful of customers — which is why efforts like Altaeros’ are badly needed.